Is A Cohabitation Agreement Legal? In not too distant past, cohabitation agreements were not legal as living together without being married was considered against public policy. However, nowadays they are legal and in fact, several provinces have statutory provisions codifying their legality. In Ontario, section 53 of the Family Law Act is the statutory authority permitting them. 1. Signatures and Witnesses. A cohabitation agreement must be in writing (no oral cohabitation agreements), and signed by both parties entering into the agreement. Each signature must be witnessed (and it is a good idea to use someone whom you will be able to locate many years into the future if needed). 2. Financial Disclosure. You and your partner must provide complete disclosure of your financial situation to each other prior to entering into a cohabitation agreement. The disclosure include both income and financial assets. Financial disclosure must be detailed – i.e., it’s not enough that your partner knows you own an RRSP, they must also know its value. Courts take the view that you can’t intelligently enter into a cohabitation agreement without this information so if this isn’t done, your cohabitation agreement risks being invalidated by a judge. It is a good idea to include the financial disclosure as a schedule to your cohabitation agreement, or at least keep the papers showing financial disclosure was made. 3. Duress or Coercion. As is true for any type of contract, duress or coercion to enter into a contract can result in the contract being invalidated. So, don’t put pressure on your partner to sign a cohabitation agreement. Often the pressure won’t come from your partner, but your partner’s family – perhaps their mother or father. That sort of duress or coercion can also result in a cohabitation agreement being invalidated. In other words, courts only enforce contracts that are entered into by both parties of their own free will. 4. Grossly Unfair. Judges can also invalidate a cohabitation agreement on the ground that it is grossly unfair. For instance, if after a long term relationship one partner is left destitute while the other is extremely wealthy, a court is likely to step in and address this perceived injustice by voiding the cohabitation agreement. 5. Illegal Clauses. Certain things are not permitted to be in cohabitation agreements. The most important of these things are clauses relating to child custody and child support. As well, this includes any illegal acts or “moral” type clauses such as penalties for adultery. If these sorts of clauses are included in a cohabitation agreement, they normally will be struck out without affecting the rest of the agreement. In short, if you are fair about things when entering into a cohabitation agreement, and follow the required rules, the chances are very good that your cohabitation agreement will be valid. If you’re considering a cohabitation agreement — or have already made your decision — you’re invited to call or email us. We’ll explain for free how you can protect your assets and plan your estate. You can call us toll-free at (800) 407-2570 or email us using our contact form here. We can help you anywhere in Ontario, including Ottawa, Toronto, Mississauga, Brampton, and Hamilton. @Kathleen, I wish I could give you a simple answer, but there is not one. It is going to depend on the precise wording of the cohabitation agreement and the will, as well as the circumstances surrounding their being entered into. It is situation that requires a detailed review by a lawyer. Do you have to “file” the cohabitation agreement somewhere in Ontario after it is created and signed? Or after its signed do you just keep it in a safe until the day its needed? @JJ – there is no filing the cohabitation agreement. Yes, you just keep it in a safe place until needed. Began living together since July1 2008. Bought a house in August 2008 but my name is not on the title. I recall something to the effect of my credit was not favorable at the time, but he got the mortgage in his name (?maybe with my income? )… I earn more than twice as much as partner and have 2 dependents still at home. He has no dependents. I pay almost all the bills, maintenance and repairs to the home, groceries etc. Not looking to break up or leave but I now understand I have almost no rights in this situation. What is my best next step? @Michelle – For common law in Ontario, each party keeps what is in his or her name if the relationship ends. So, if the house is in his name, it remains his. If it is just the house at issue, then that can still be transferred into joint names. Otherwise, if more assets are at stake, a cohabitation agreement would make sense. I have a cohab agreement with my partner, in the agreement it says that it will be binding in the event of marriage. I have heard that the Ontario law is that once a couple gets married the whole document regardless of what is says is nil and void. Is that a fact? @Cathie – All cohabitation agreements remain in effect when a couple marries, unless the agreement specifically states otherwise. Does the cohabitation agreement need to be sworn similiar to an affidavit? Or are the only signatures that are required are those of the parties involved and the two witnesses? @Todd – No, a cohabitation agreement does not get sworn (or for that matter, notarized). Simply signed by both parties and signed by a separate witness for each party. Can a co-habitation agreement be between a man and a woman who are living together but are not actually together? Would it work for that? I mean they are friends, not in a relationship, just sharing the home together as room mates. @Cookie – If they truly were just roommates, then there would be no need for a cohabitation agreement, as neither of them would have family law rights or obligations. 7. Children – did you interact parentally with each other’s children? Is a cohabitation agreement valid if its not signed? Im currently going through a divorce, my ex is stating that there was a cohabitation agreement between us and hes provided his lawyer with a “copy” of a supposed cohabitation agreement but the agreement is not signed by any of us or dated, if he provides that to court would that document be valid infront of a judge? @Anna – A cohabitation agreement must be signed and witnessed for it to be valid. I don’t know enough about the specifics of your case to comment on it. But it could be that your ex is claiming that the agreement existed and was destroyed, or something like that. When a couple has a cohabitation agreement and one of then dies is the cohabitation agreement superseded by the will of the deceased? @Trish – A cohabitation agreement comes into effect when a relationship ends. A relationship can end either via separation or one party passing away. So, you can put into your cohabitation agreement what you want to happen with your estate. If you do that, then normally that will override anything in a will. So, for instance, a cohabitation agreement may state that upon death, each party will leave their interest in the matrimonial home to the other. If one partner passes away without leaving their interest in the matrimonial home to the other in their will, then the surviving partner can choose to enforce what was set out in the cohabitation agreement. MY name is on the deed of the house. Can he sell the house without my permission? @Marie – No. The deed is public notice that you own an interest in the house, and the lawyer on the real estate transaction would see that. witness for my son, or does it have to be someone unrelated? @Sue – Yes, in theory that’s fine, but I would recommend that your son’s girlfriend use a different witness, otherwise there could be allegations in the future that you pressured her to sign. Can a cohabitation agreement be made after having lived together for 3-4 months? Can it be made anytime prior to the 6 month mark? @Christina – Yes. You can make a cohabitation agreement at any time, even if you are living together, and even if you have lived together for many years. can a cohabitation agreement be drawn up when separating with agreement of support when signed and notarized by a notary as witness, can this Agreement be enforced as a contract.? @Chrissie – It is too late to do when you are already separating. 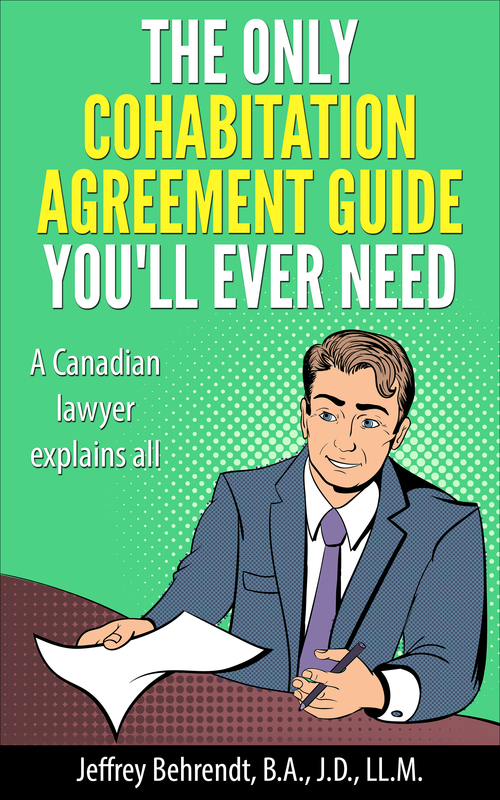 You can enter into a separation agreement, which deals with similar issues, but from a different point of view. What legal form is to be used for a cohabitational agreement? Also, if one side owns a home prior to cohabitation and the other side is proportionately contributing to the household expenses ( including mortgage, insurance etc) during cohabitation, would the other side have any claim to the home equity gained during cohabitation in the event of a breakup? @Joan – It’s not just a form – a cohabitation agreement is a multi-page contract (10 to 20 pages normally) that is specifically prepared for you and your circumstances. As for contribution to household expenses, yes, without a cohabitation agreement, if one party contributes to household expenses during cohabitation, of a home that they do not own, that party may well have a claim to some of the equity in the home under the principles of unjust enrichment. What happens if your ex forges your signature on a cohabitation agreement and you paid a forensic signature analysis to examine the document and they indeed indicate your signature was not signed by you? @Lee – A cohabitation agreement must be signed by the party entering into the agreement, otherwise it is not valid. Another requirement is that the agreement is also signed by a witness, in part so that this sort of thing does not happen. If there is no witness, the agreement is not valid. If there is a witness, you will want to check what the witness has to say about your signature. 1) equal division of all assets & debt. 2) he has promised, in event of separation, to pay 50% of his net income to me and the children for 10 years, followed by 8 years at 18% of net income for additional 6 years, (total 216 months). Is there a law against using percentages rather than flat rate? *he is commission income with no base salary, that’s why we’ve chosen us use %’s rather than flat, so we’re on same footing. 3) I have agreed not to seek child support so long as he’s current on payments; and in the Cohab Agreement, I state that “I’ll pay for my share of children’s expenses through the support payments from him; we REALLY want to keep our family business out of courts; I don’t explicitly “waive right to child support”, because I don’t know if that is unlawful and I don’t want to make the contract voidable by “waiving” my right to child support, I don’t explicitly “waive right to child support” in the agreement. 4) The support payments are essentially a combination of support-types: palimony, compensation for my own income loss, loss of career advancement, loss of years to contribute to my retirement, and support for children, is it proper to refer to it as palimony in the agreement or support? 5) What is proper “consideration” for Cohab agreement? Is it “cohabtition “or “mutual promises”, or “quit job to provide homemaker services for future compensation” or something else consideration? 6) Do we make a retroactive effective date, since we’ve relied on these oral promises for the many years, or use effective date of signing written version? 7) Is this a Cohab or Non-marital agreement? Thanks so much, I find your articles fascinating and well written, so THANK YOU! @delia – Please note that there is no such thing as an “oral” cohabitation agreement. The Family Law Act requires a cohabitation agreement to be in writing. 2. Letting spousal support be a percent of the payor’s income is an approach that is alright to use. 3. Regarding child support, a court generally will not enforce anything you put in a cohabitation agreement about it. Even if you do not explicitly waive child support in your agreement, you would still have the right to apply for it if your relationship ends, and that would be on top of any support payable under the agreement. That being said, you could set out a formula in your cohabitation agreement that takes into account child support. So, for instance, instead of spousal support being 50% of net income, it could be 50% of net income less child support. 4. “Palimony” is an American term, and does not have any meaning under Ontario law. The term you are looking for is spousal support. 5. The consideration in a cohabitation agreement is the mutual promises that the parties give each other. 6. A cohabitation agreement is effective on the date that the last party has signed it. I do not see anything in your agreement that would need to be made retroactive. 7. A cohabitation agreement is for couples who are not married. Yes, the issues you cover are precisely what is in a cohabitation agreement, and a good example of what one can contain. I purchased a property with my boyfriend but he did not spend a dime, we used all of my money for all downpayments, closing costs etc. I would like to make a cohabitation agreement that clearly states these facts. Does it need to be written by a lawyer or can we write one ourselves and have it legally bibding if we follow all necessary steps? It’s normally best that both parties have their own lawyers. Without that, the agreement always risks being challenged in the future on the ground that one party did not understand the agreement, or did not understand how the agreement impacted their legal right, or that they were pressured into signing the agreement. Girlfriend and I are talking about moving in together in house which I own. She is willing sign a cohabitation agreement. What is the best way to receive partial reimbursement for household expenses and not have to worry about future claims of equity in the house? You can set out in your cohabitation agreement everything regarding your house – how expenses will be handled, any reimbursement that your girlfriend is entitled to, and that she will not received any interest in your house other than as set out in your agreement, regardless of any financial or non-financial contributions to your house. My partner and I signed a cohabitation agreement 17 years ago, now we wish to get married. The agreement does not have a “marriage: clause and says it will continue as a marriage contract. We wish to void the agreement, as the terms of the agreement are no longer relevant. Do we each need to seek legal guidance from independent family law experts, or can we just dismiss the agreement and move on together? A cohabitation agreement continue in effect even when you get married. If you do not want the agreement to apply any more, you do need to take a positive step and sign an agreement terminating your cohabitation agreement. @Mik – any adult can act as a witness – your witness does not need to be a lawyer or a notary. For common law in Ontario each party keeps what is in his or her name if the relationship ends. Why do I need a cohabitation agreement. @Hilda – That’s the basic rule, and in the short run, that is likely what will happen. However, the longer the relationship, the more likely a court will be willing to find that one partner has been unjustly enriched, and divide property that way. Also, couples may now want each party to keep what is in his or her name, particularly if they are planning to have children. As well, a cohabitation agreement can deal with spousal support, which after 3 years, is essentially the same as for married couples. @Jake – It is always best if both parties have lawyers. The reason for this is so that neither one can later claim that he or she did not understand the agreement, did not understand their family law rights, or was pressured into signing the agreement. My husband forced me to sign a cohabitation agreement.we are married but I left the marriage for 17years came back to the home 4years ago.we are both in our 60 s .I am on odsp making$1400 per month. I pay bills and buy groceries clean the house cook and other things.baby sit my grandkids. He is verbally abuse and puts me down. I want to void the agreement how can I do this. If he passes before me I will most likely be homeless. @Rosemarie – It really depends on what you mean by “forced”. A cohabitation agreement needs to be entered into voluntarily by both parties without any duress for it to be valid. Whether your situation would qualify as duress is something that would need to be discussed in detail with a lawyer. I have more assets by quite a bit than my boyfriend. He still maintains his rental but we are essentially living together as of few months. He agreed to sign a palimony agreement. Problem is I don’t want to disclose my assets. He would agree to this and we decided that we would set up a joint account to pay big expenses and that would be divided up 50-50 upon separation unless decided otherwise but this would be the only asset to divide unless we co-mingle funds elsewhere, which is not the plan. He would pay living expenses as I am providing the homes (he will get rid of his rental). Everything I read says balance sheets need to accompany the palimony agreement, can we agree to not do that and have it hold up in court? @Jill – From a legal point of view, you are entering into an agreement regarding both of your finances, and to make an intelligent decision about that, you need to be familiar with each other’s finances. Lack of financial disclosure is a ground upon which a cohabitation agreement can be invalidated, so you would be taking a big chance in entering into a cohabitation agreement without the required financial disclosure. I own a mortgage free house and have savings as well. I have no debts whatsoever. I am planning to have my partner move into my house. Both house and banking is in my name. we do not have a joint account. If we draft our own cohabitation agreement and sign with different witnesses am I fully protected in the future or does he have any claim to my house and money at all? Also what about any debt going forward? I don’t want to be responsible for his debts nor owe him part of my house. @Izzy – If the agreement is properly drafted, and both parties understand the legal impact of the agreement and their rights, and no one is pressured into signing it, then yes, a cohabitation agreement can protect your house and all of your assets, as well as state that each party is responsible for his or her own debts. If full financial disclosure wasn’t given in the agreement is it still valid. I gave mine but he only listed where he has his bank accounts and investments and did not list his income. @Sasha – It is a ground for challenging the agreement. Whether the challenge will be successful will depend on all the circumstances of your situation, including what the agreement says, the negotiations leading up to the agreement, why the information is not there, what discussions took place, what you knew about his financial situation, etc. My daughter and her step-brother are purchasing a house together (they are not common-law). She is putting down a sizeable downpayment (40% of the purchase price) at the time of purchase. He is not contributing anything towards the downpayment. They will each be responsible for 50% of all of the house expenses (mortgage, property taxes, utilities, upkeep, etc). They have verbally agreed that when the time comes to sell the property, after expenses were paid, she would receive her initial downpayment back in full and the balance of the equity would then be split 50/50 between the two of them. It appears as thought a cohabitation agreement would not work for this situation. Can you suggest any other type of agreement they could use? @Linda – A cohabitation agreement is exactly what they need. See my response to Molly below, which I just posted. My partner and I (we are common-law) are buying our first home and my parents are giving me a significant chunk of money towards our downpayment. They want to make sure that if my partner and I split up, the $ will go back to me, and not be split 50/50 since it’s being put towards our matrimonial home. Could there be a cohabitation agreement that stipulates that in the event of separation, the $ that they gave goes back to me and is not split? @Molly – Yes, definitely. This is one of the most common scenarios I see. Typically, such an agreement states that if the home is sold or the couple separates, then each party gets back their respective down payments. You can also put in provisions for what happens if one of you passes away, and set out how future homes would be dealt with financially.